Since John Baskerville was baptized on 28 January 1706 (old style), he was probably born a week or so earlier in January 1707 (as expressed in the ‘new style’ that we use today, in which the year begins on 1 January). Doing research for his projected Baskerville exhibition, which never took place, Justin Howes turned up this completely unknown specimen of Baskerville’s Small Pica in the Warwickshire County Record Office. 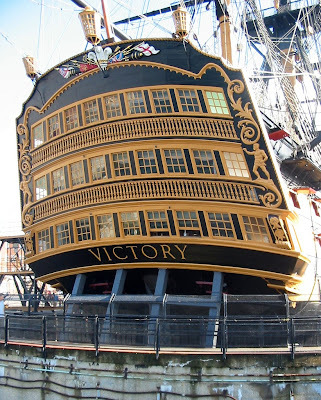 In the post with the title English vernacular there is a reference to the name painted at the stern of HMS Victory in 2005, when she was refurbished with the intention of bringing her back to her state in 1805. The one conspicuous failure in this well-intentioned programme was the anachronistic choice of ‘Trajan’ capitals for the name, a style that even the Ministry of Works – which used it on signs for everything from iron age camps to royal palaces – might hardly have dared to suggest for this purpose if it had been asked for advice in (say) about 1950. The painting, above, by Louis-Philippe Crépin, 1807 (Musée de la Marine, Paris), shows a distinctly French view of Victory and Redoutable at Trafalgar, with a sharp-shooter aloft in Redoutable in the act of killing Vice-Admiral Lord Nelson, and the battle ensign of Victory trailing in the water from a severed mast. (Redoutable later struck her colours, and sank next day.) 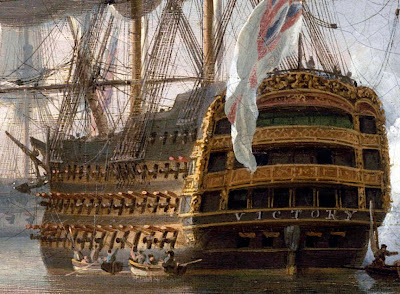 Although the state of Victory’s stern shown here was derived by the artist from an earlier source and the detail is minimal, this painting is one of several that confirm that the name was indeed painted there. 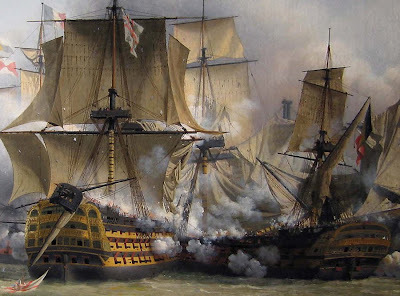 The small detail, below, from a painting by Nicholas Pocock, an invented scene bringing together all the flagships that had been under Nelson’s command, shows the same anachronistic view of the open stern galleries of Victory that did not survive her major refitting completed in 1803, but gives an even more convincing view of the large letters of the name painted across the counter. Above Painting by Nicholas Pocock, ‘Nelson’s Flagships at Anchor’, 1807. BHC1096 (detail). Below Ship model ‘Barfleur’, SLR0453. © National Maritime Museum, Greenwich, London. But as a style of lettering they both seem likely to be considerably closer to the one in which the name of Victory must have appeared in 1805. Perhaps they could be borne in mind when the next repainting is planned, a little sooner (one hopes) than 2105. My thanks to David Collins for his images of Victory in 2005, and to the National Maritime Museum, Greenwich and the Musée de la Marine, Paris, for their generous help. Trafalgar Square is one of the very few public spaces in Britain that have the feeling of an outside room, designed as a place to meet in, like St Peter’s Square in Rome or St Mark’s in Venice. The north side, at the head of the sloping site, is occupied by a single public building, the National Gallery. To the south there is a view of Whitehall, closed in the distance by the Houses of Parliament. Since road traffic was excluded from the north side of the square two years ago, it has become an even more attractive space, the natural centre of the capital city. Architectural critics have never been enthusiastic about the design of the long façade of the Gallery. It was planned during the 1830s and it is the work of William Wilkins, who also designed the buildings of University College in Gower Street. In his time Wilkins was one of the new enthusiasts for Greek (rather than Roman) architecture, and his buildings are distinguished by accurately observed historical detail. But for most people this bland façade with its pedantic Greek elements just makes a dignified enclosing wall to the north. There is livelier material in the square below, from the static elements like Nelson’s Column and Landseer’s lions to the ephemeral ones, like the political assemblies that have met there since the 1880s. The addition to the text of THE seems rather flat. Perhaps it was added to fill out the short inscription. The letters could not be taller because there is no room for them to be taller. Perhaps – but, no, there is no ‘perhaps’ about it – the building was never designed to have letters cut on it. 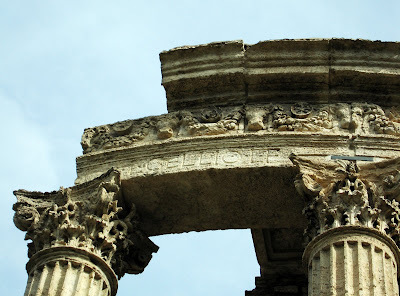 It is a Greek building, and the Greeks of the Athens of Pericles, unlike the Romans who later conquered them, used small, simple, geometrical inscriptional letters, and they rarely put them on their buildings. Nor indeed, two hundred years ago, did the British. There are hardly any identifying inscriptions on the new public buildings that began to appear in London towards the end of the 18th century and during the first decades of the 19th: Chambers’s Somerset House, Soane’s Bank of England (he put some on his drawings, but they were not added to the building), Smirke’s British Museum, the Barry–Pugin Houses of Parliament. Perhaps there are elements of English snobbery at work here: the Pall Mall clubs and – until very recently – the Oxbridge colleges had no names on them, and the Bank of England prudently kept as low a profile as it could. You either knew what these buildings were without having to be told – or you had no business to know. At any rate it was left to continentals to put redundant names like ASSEMBLÉE NATIONALE in big letters on their legislatures. Sometimes, to be fair, the addition of the lettering had a purpose. A gesture of national dedication lies behind the inscription DEM DEUTSCHEN VOLKE – To the German people – that was designed by the artist Peter Behrens for the grandiose Italianate façade of the Reichstag in Berlin in a deliberately non-classical style of lettering. But it was not placed there until 1916, when the success of the War began to falter and it was added at the order of Bethmann-Hollweg in the name of national solidarity and political liberalism, with the grudging consent of the Kaiser. To return to the matter of the National Gallery and its new inscription, there are several grounds for criticism. I have mentioned the first, which may be called the art-historical objection, namely that the Greek architecture on which the building is so scrupulously modelled would not have had lettering on it, certainly not lettering on the scale of the splendid but vulgarly aggressive inscription of the Pantheon in Rome, which is the ultimate model for so many pedimented fronts, from S Maria Novella in Florence and St Peter’s in Rome to the French and German examples mentioned above. An English example is St Martin’s in the Fields, just to the right of the National Gallery, which bears a dedication in big lettering, aimiable but unsophisticated. It is worth noting that this was a building that Wilkins heartily detested. The name on the front of the original Pantheon in Rome is that of a city boss, Agrippa. Powerful family names are prominently displayed on the Italian examples too: those of Rucellai, the banker, in Florence, and Borghese, also known as Pope Paul V, in Rome. There is an air of self-promotion about these inscriptions. However, if we accept for the moment that new lettering may sometimes be legitimately added to an old building (we shall return to this – a crucial question – below) what style should be used? It is not a simple matter. One option would be to ask what lettering the architect of the National Gallery would have chosen, if his wishes to keep it free of an inscription – which seem pretty clear – had been overridden. Two models suggest themselves. One would have been the Roman lettering of the period. Fortunately there is an excellent example close to the Gallery itself, the ‘National Schools’ just to the north of St Martin’s Church, built in about 1830. Its name is in a big and splendid letter, deeply incised into the façade. It has been admired by, among other knowledgable people, Nicolete Gray (Lettering on buildings, 1960, fig. 60). There is a good image in Phil Baines and Catherine Dixon, Signs: lettering in the environment, 2003, p. 121). A bolder choice among models for contemporary lettering would have been a sanserif. 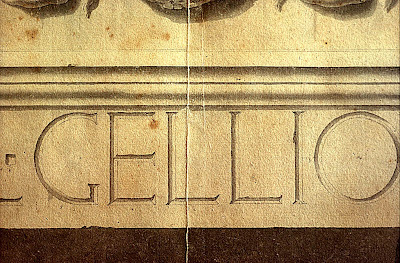 This style of lettering was a revival at the end of the 18th century – the originator seems to have been John Soane – of the primitive form of Roman letter that stood in relationship to the more florid Imperial model of the first century like that of early Greek or Roman architecture to the later periods. (See the post headed ‘The Nymph and the Grot, an update’, in this blog, and also The Nymph and the Grot, 1999.) Not only had Wilkins’s own father used such lettering in the captions to the plates in his essay on some Roman remains near Norwich (in Archaeologia, 1796), but Wilkins himself used sanserifs on his design for a Nelson monument in Dublin, consisting of a large Greek Doric column. One could equally cogently have argued for the choice of some non-historical model, such as was done successfully (but in very special circumstances) in Berlin. Indeed one can imagine that a quite elegant modern monoline but Greek-inflected sanserif – Edward Wright’s ‘Flaxman’ letter for New Scotland Yard, for example – might have combined the best of both responses to the problem, if that was what was needed. Fortunately a literal rendering of the Bembo font was not the model for the letters that were actually cut. They are the work of Brenda Berman and Annet Stirling, whose lettercutting partnership is known as Incisive Letterwork. They made a quite free adaptation of the Imperial Roman stone-cut model which underlies the original printing type of 1496 from which the typeface Bembo was itself adapted. What they did was intelligently and sensitively executed, and I do not wish my words here to be interpreted as criticism of the quality of their work, for which I have great respect. But if we apply the ‘art historical’ test to this example, as lettering to be added to a Greek design, the work of a scrupulous and purist architect, it is difficult to see how a more alien model could have been chosen. When the Romans conquered Greece they might have cut the name of an emperor in big Roman letters across the front of the Parthenon. Happily they did not. The choice of an Imperial Roman letter is no less insensitive and inappropriate in the present case. However the choice of the style of lettering is not the most important question at issue, which is, how it was possible for so radical an alteration to be made to the appearance of one of the most prominent public buildings in Great Britain, one that had survived intact for 170 years and that one would therefore expect to be protected against the passing whims of its tenants. And so it is, at least in theory. An application for permission to add the inscription was made to the planning department of the City of Westminster. And they in their turn, since a listed building was concerned, sought the advice of the body called English Heritage, who gave their permission without hesitation, and perhaps without giving the matter much thought. At all events, I cannot find any evidence that any there was any serious consideration of the principle of cutting prominent lettering into a very well-known public building, one that was in all probability deliberately designed not to have lettering applied to it. Or that any informed consideration was given to the model for the lettering that was proposed. This disquieting aspect of the whole episode is why I am discussing it here. It is possible that in the future an similarly ill-judged alteration to a more important work of architecture may be proposed, and the decision in the case of the National Gallery may be cited as a precedent. So let us be clear about the reasons why the addition of this inscription is such a clumsy and offensive act. It is one of the first principles of the conservation of works of art, and one that one would hope that the director of an art gallery would not only be aware of but endorse and follow, that so far as possible no irreversible intervention should be made in the process of restoring a painting. The National Gallery’s building is no less a work of art than the paintings it houses, and it is one which is equally deserving of the care of its director. A plea has been made to me, by way of excuse for what has been done, that the National Gallery needed to be identified so that people would not confuse it with the National Portrait Gallery next door. That seems a pretty feeble argument. 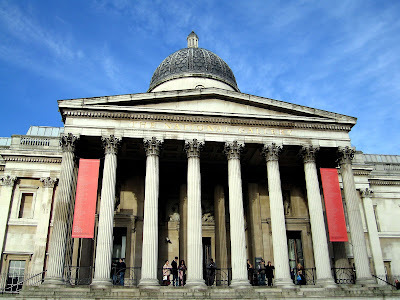 The entrance to the Portrait Gallery, a smaller building, is round the corner and cannot be seen from Trafalgar Square. And English Heritage has suggested to me that it will eliminate the need for those big banners for blockbuster exhibitions. I will believe that when I see it happen. But if we grant some validity to these pleas, what were the practical options? Not very long ago the name of the British Museum was placed clearly in large metal letters on the entrance pavilions and Smirke’s Ionic portico was left intact. I am not hugely enthusiastic about the lettering that was used, but if necessary it could be removed and would leave hardly a trace. A couple of decades ago the name of Street’s gothic Law Courts in the Strand was added by attaching to the wall gothic letters which seem to have been modelled on William Morris’s Troy type. I think the effect is bizarre, but again they could be removed cleanly. The Behrens inscription on the Reichstag is similarly made of applied, and detachable, metal plates (cast from the bronze of French cannon captured in 1813 at Leipzig). Something might, in all humility, have been learned from these examples. The Director of the National Gallery, operating in Ozymandias mode, has had his inscription cut deeply and indelibly into the fabric of the building for which he is responsible. What he has committed is not merely an error of judgment which inevitably raises questions about his fitness for the post, but an act of vandalism which must not be allowed to legitimate a similar exercise in the future. In March 2007 it was announced that Charles Saumarez Smith, the Director of the National Gallery, would leave his post later in the year to become secretary and chief executive of the Royal Academy. This is a detail from a ‘Design for a British Senate House’ (Sir John Soane’s Museum, London) that was drawn by John Soane when he was in Rome, and which was exhibited at the Royal Academy in London in 1779. It is the earliest known example of the monoline sanserif inscriptional letter of Republican Rome that was revived at this date and became widely used for signs and typography. ‘The Nymph and the Grot’ was the title of an article that I wrote in the journal Typographica (new series, 12, 1965). It explored the background to the appearance of geometrical, monoline sanserif lettering in Britain towards the end of the 18th century, at a time when all professionally drawn letters, including printing types, had a marked contrast between thick and strokes, and serifs too. (See the post on ‘English vernacular’ in this blog.) And it suggested that this letter was the origin of all the sanserifs of the 19th and 20th centuries, from the Caslon ‘Egyptian’ of (about) 1816 to Futura, Univers and their descendents. The lettering of the inscription at Stourhead was in capitals and lower case, with thick and thin strokes and no serifs, and I wondered if it might have been a deliberately primitive serifless style of lettering that had been chosen to match the primitive architecture of the grotto. As for ‘grot’, that was also what British designers in the 1960s called the traditional ‘grotesque’ sanserif types, and Typographica was set in Monotype’s Grotesque Series 215, a type adapted from the Bauer typefoundry’s Venus-Grotesk and originally made in the 1920s for the German market. It was taken up in the 1960s by British designers who had no access to exciting new types like Helvetica (German and US Linotype matrices would not run on British machines) and who were tired of waiting for Monotype to finish cutting all the punches for Univers. Or maybe they did not want to use the rather bland Univers anyway. Its suitability for association with Soane’s own minimalist version of Roman architecture seemed obvious, and also with the basic geometrical forms that underlie the work of contemporary neo-classical architects from Boullée to Jefferson. The drawing is in fact a copy of one made in 1763 by George Dance, the architect to whom Soane had been apprenticed. In about 1779, during his own stay in Italy, Soane had used sanserif capitals on a drawing for a ‘British Senate House’ that he was submitting to the Royal Academy in London in the hope of a prize. (See the image at the head of this post.) And he went on using them, not only on all his drawings, but also putting them into his designs, apparently intending to have them cut in the stone. They are in his designs for the Bank of England, but they never got cut. Perhaps the client resisted. And in his designs for a new House of Lords, but that never got built. However, other architects soon adopted the style for the lettering on their own drawings, and then, somehow, the style became a part of the repertoire of professional lettering artists and entered the wider world of signwriting and publicity. In 1999 when the St Bride Library needed publicity in order to raise funding to get it out of its current crisis, Justin Howes worked with me on an exhibition at the Soane Museum in London, called ‘Primitive types’, which was about sanserifs in Soane’s original drawings and the whole history of the early sanserif letter. To coincide with the exhibition we rushed out a slightly updated reprint of The Nymph and the Grot, which was very generously and beautifully printed without charge by the art printers BAS in order to help the library. This, said the text, was the ‘old Roman letter’. It continued, ‘I find it convenient to no classes except the house painters, who must gain considerably by repainting so great a portion of the metropolis, and who can apply apprentices to so simple a letter, where abler and more expensive workmen were necessary heretofore,’ and concluded, ‘the warmest advocates of these letters cannot but allow, that they are clumsy in the extreme, and devoid of a single beauty to recommend them, or any thing whatever, except their antiquity’. So 1805 was the year of the Egyptian (or old Roman) letter. And of England beating France and Spain (Trafalgar). And Napoleon beating the world (Austerlitz). A rather hysterical year, if you look at the newspapers. People had certainly been getting more and more interested in Egyptian things towards the end of the 18th century. One thinks of designs for Egyptian fireplaces by Piranesi and of the Mozart and Schikaneder Magic Flute (1791), with its hymn to Isis and Osiris. In 1798 Napoleon set off to conquer Egypt, for several reasons but chiefly to make life difficult for England by blocking the most convenient route to India. And the craze for anything Egyptian – ‘Egyptomania’ as it was called – got even more frantic. He took with him an army of scientists, botanists and linguists who wrote the massive volumes of the Description de l’Egypte that started appearing in 1809 and continued for 20 years. These, by the by, are all set in the romain du roi (the Grandjean type). There is no use of a slab-serif type anywhere in them. Most people called the new letter by the popular name of ‘Egyptian’, even though nobody seems seriously to have thought that the letters were really modelled on Egyptian ones. ‘Old Roman’ was the – essentially correct – consensus. English sign painters and some other lettering artists went on using the name ‘Egyptian’ for sanserif until into the 20th century. In 1816, when the Ordnance Survey, the government map makers, wanted an appropriate style with which to pick out Roman roads and other Roman antiquities on the new ‘One inch’ maps, they chose what they called ‘Egyptian’ letters, which of course were sanserifs. Justin told his friends about some of his discoveries and talked about them in lectures, but he had not got round to publishing them when he died very suddenly in February 2005. So it is up to his friends to tell people about his work, and that is one reason for this update. 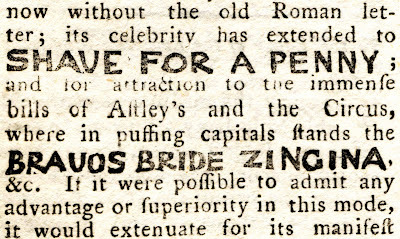 The Caslon ‘Egyptian’ type of 1816, or perhaps a bit earlier, which was certainly the first sanserif printing type to be sold commercially, was not as isolated or as novel as people sometimes make out. By that date Egyptians, or sanserifs, were everywhere, in books and engravings and lithographs, and on buildings and sculpture, and as I’ve said, even on maps. The reading public must have been getting quite used to them. 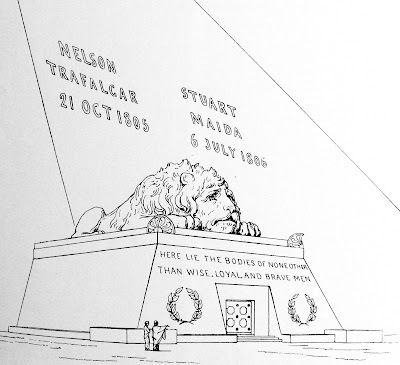 Here is one of my favourite examples, which I showed in the first version of The Nymph and the Grot, a project which alas was never realized: it was a proposal for a monument to Nelson and to the military commander Stuart (victor at the battle in Calabria in 1806 that is commemorated by Maida Vale in London), published in 1808 by one William Wood. The structure would have been a vast pyramid on the downs to the north of Portsmouth, with lettering in what Wood called ‘the earliest Roman character’, that is, a sanserif, of which the simple design was recommended among other reason because it was the ‘least susceptible to decay’. I have been keeping a list of other dated examples of early sanserifs which I’ll publish in some form (contributions welcome). In fact the typefounders were the only professional makers of letters who refused to have anything to do with them, and they held out for another ten years or so. It seems quite possible that they dismissed the style as a bizarre and amateurish whim that was clearly not going to last. 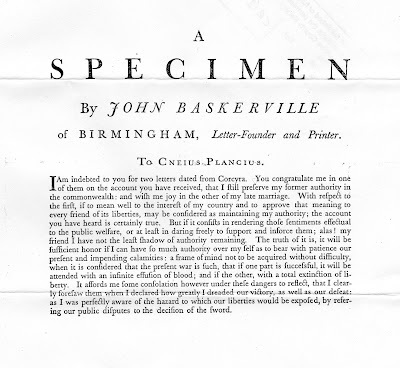 That is why I think that the Caslon Egyptian – which is shown halfway down a page in the Caslon specimen and is given no special emphasis – may possibly have been ordered by a client rather than originated by the foundry, and that the foundry just suppressed its principles, took the money and made the type. 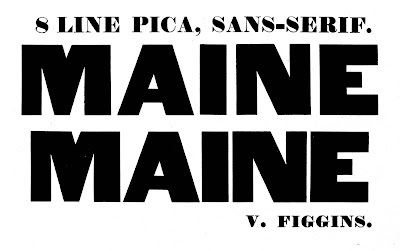 Eventually, but not until the later 1820s, the typefounders did give in and started following the trend, with the ‘Sans-Serif’ type from Figgins, and the ‘Grotesque’ from Thorowgood. 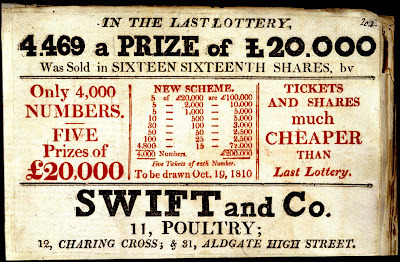 In the 1830s the Blake, Garnett foundry (later Blake & Stephenson, and later still Stephenson, Blake) in Sheffield, who had bought the matrices of the Caslon Egyptian, relaunched the original type with the substitution of some bad wrong fount characters – but that is another story. It would be nice if we could find a contemporary example of the Caslon Egyptian used in a real book, not just a type book, since that might give a clue to the identity of the possible client – if there was one. I said above that ‘sanserif’ was a mistake on the part of the OED. The headword ‘Sanserif’ in the entry in the original dictionary (shown above) was quoted from a Figgins type specimen dated 1830, the only known copy of which just happened to be in the library at the University Press in Oxford, the printer of the dictionary. But when I checked the name in the specimen (which is now in the Bodleian library) I found it was SANS-SERIF, and the size was given as 8 LINE PICA (not ‘Lines’). In the dictionary the quotation from the heading in the Figgins specimen has ‘San-’ at the end of one line and ‘Serif’ at the beginning the next, the ‘s’ of ‘Sans’ having been lost. When they wrote the headword did the editors perhaps read the hyphen as a word-break (notwithstanding the capital letter in ‘Serif’) and delete it? 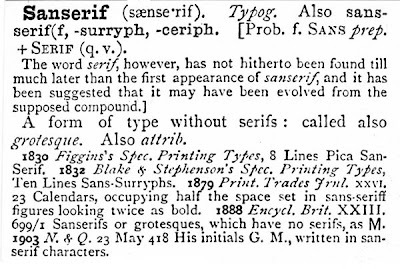 So the original authority for the term ‘sanserif’ in OED appears to have been based on an error of transcription, and the word should not have existed. Except that, curiously, it did. The OED has some other quotations showing this spelling, used long before the ‘S’ volume of the dictionary was published in the 20th century. One example from an authoritative source is ‘Sanserifs or grotesques, which have no serifs’, from the 1888 edition of the Encyclopaedia Britannica. By using it myself I suppose I have added a bit of legitimacy. Some of the points discussed above were raised by contributors to Typophile Forum, in a thread headed Egyptian slab-serif. It was suggested that the answers were in The Nymph and the Grot. Some of them are, and there are still copies available from the St Bride Library, which gets the money from sales of the book. But I thought that it might be helpful to publish this summary, and to add a note on the additional information that has come to light since 1999, some of which was turned up by the researches of Justin Howes.